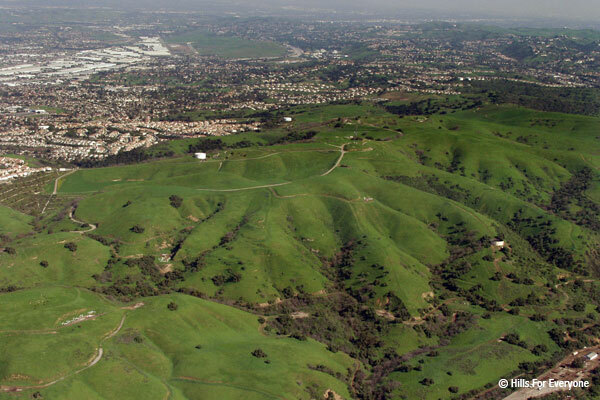 These 3,000 acres are the undeveloped hills serving as the backdrop of Brea and Rowland Heights. They encompass the woodlands along both sides of the 57 freeway and across the hills to Harbor Boulevard/Fullerton Road. Shell-Aera has stated they plan to reapply to Los Angeles County to process the development plans. Aera Energy representatives also, however, stated at a public meeting in October 2008, their willingness to sell the land, but when presented with the opportunity to have it appraised they made unreasonable demands for the appraisal and ultimately were removed from consideration. The landowner, Aera Energy, is jointly owned by affiliates of oil giants Shell and ExxonMobil. 90% of the property lies in unincorporated southeastern Los Angeles County while 10% lies in Brea’s Sphere of Influence in north Orange County. Aera Energy, has proposed building 3,600 houses which would generate an estimated 50,000 new vehicle trips a day to area streets and freeways. Aera has tried to process this project through Los Angeles County Planning and through Diamond Bar. Both jurisdictions told Aera to redesign the project to make it greener and less impactful. Thus far Aera has refused and the project is no longer being processed anywhere. With the market having shifted in this recession, and executive houses no longer as marketable, it is unknown what Aera will do next.